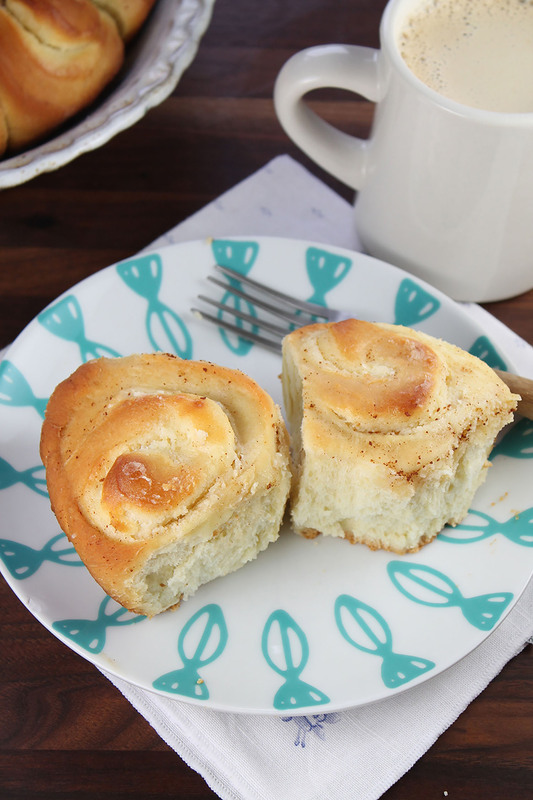 These rolls are pillowy soft and the cream cheese filling makes them just the slightest bit decadent and the brown butter and maple glaze just pushes them over the top to amazing! Add warm water, yeast and sugar to the bowl of a stand mixer fitted with a paddle attachment and set aside for about 5 minutes or until yeast starts to bubble. Add ¾ cup softened butter and eggs and beat until combined. Add 1 cup of flour and mix until combined. Add salt and continue adding flour until dough starts to pull away from sides of the bowl. Switch to dough hook attachment. Knead for 5 to 7 minutes until dough is smooth. Place in oiled bowl, cover and set aside to rise for 45 minutes to 1 hour, until doubled. Prepare the filling: add cream cheese, egg, sugar, flour and vanilla mixing bowl and mix until smooth. Punch down dough and divide in half. Roll each piece of dough into about a 8x11-inch rectangle. Spread half of filing onto each dough rectangle. Roll up from the long side and pinch seam together. Cut into 1½-inch rolls and place into a greased pie plates or baking pans. Cover and allow to rise 15 minutes. Bake rolls for 20 to 25 minutes or until golden brown. Cover with tented foil after 15 minutes to prevent over-browning. Prepare Maple Brown Butter Glaze: Add butter to a small pan and place over medium heat, stirring occasionally until brown bits form. Add maple syrup and brush over baked rolls. Recipe created by Miss in the Kitchen. How many degree is a warm water? Great question! Use 110-115 degrees Fahrenheit for the water temperature. The recipe is now updated to include this temperature.